If you're having trouble finding the right sign for your facility, check out Seton's vast selection of custom signs. For your more specific signage needs, we have a wide range of custom signage made specifically to allow you to create your own signs from scratch. Our easy-to-use "design your own" platform allows you to create your own signs, even when you do not have any design expertise. Simply choose the custom sign material, color, style, and size you want, then type in your own custom wording - and voila! It's now good to go. From custom directory signs, custom nameplates, custom banners, and other custom products, we have it all here in Seton! Do you need a sign but can't find the right one out of the products that you go through? If this is your dilemma, then Seton has the right solution for you. Check out our large selection of custom signs and create the sign you need with the greatest of ease. Choose from a wide variety of sign variants from our selection of customizable signs. Our custom products include custom safety signs, custom Braille signs, and more. Create your signs from scratch by choosing from any of these variants and by picking from a wide array of options that are available on each customizable page. You can also choose to upgrade your signs with Seton's Ultratuff overlaminate for enhanced protection against chipping and fading. 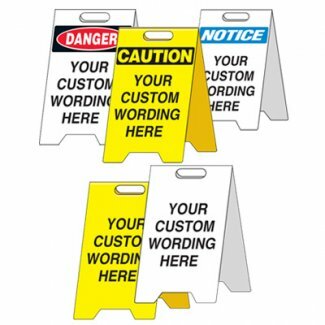 We have Custom Safety Signs that are OSHA approved and carry some of the most popular OSHA headers that you might need for your custom signage requirements. Incorporating standard OSHA headers into your signs is as easy as clicking on a blank customizable sign with the header of your choosing among the selections on the page and customizing this to your liking. You can choose among 9 headers that are available in different materials and sizes. Use these headers with standard graphics and your company specific wordings to ensure that everyone in your facility understands what you want to say.